I saw this brilliant blogger idea of Crocktober fest. I put a little twist on the idea and am using an Instant Pot instead of a crockpot. Instant Pot is basically the new crockpot anyway. I know not everyone has one of these fancy gadgets, I just got one a few weeks ago and am still learning how to use it. I don’t have a regular crockpot, but hey you could try it and let me know how it works out in the comments. So what is Crocktober Fest? It’s like Octoberfest but food blogger style. It’s a 3-day festive that I’m throwing October 11-13. Each day of the festival there will be a new InstantPot recipe that I’ve made. I’ll add notes below the recipe card for additional tips, but I won’t be posting any recipes I haven’t tried at least once! I would love to know if you make any of the recipes. Share them with me on Instagram if you find yourself in the kitchen cooking any of these up. I’m kicking off the festival with my own rendition of festive potato soup. Orange potato soup was not the initial plan, but it works because it’s even more festive now. Carrots add more nutrients to the dish. They add an extra serving of vegetables which many Americans are missing out on. My favorite fall meal is my grandma’s potato soup. It isn’t her original recipe it’s Betty Crocker’s but honestly my grandma makes it better. Her version uses butter, milk, and other non-plant-based ingredients. I’m making a plant-based rendition of this famous family recipe. 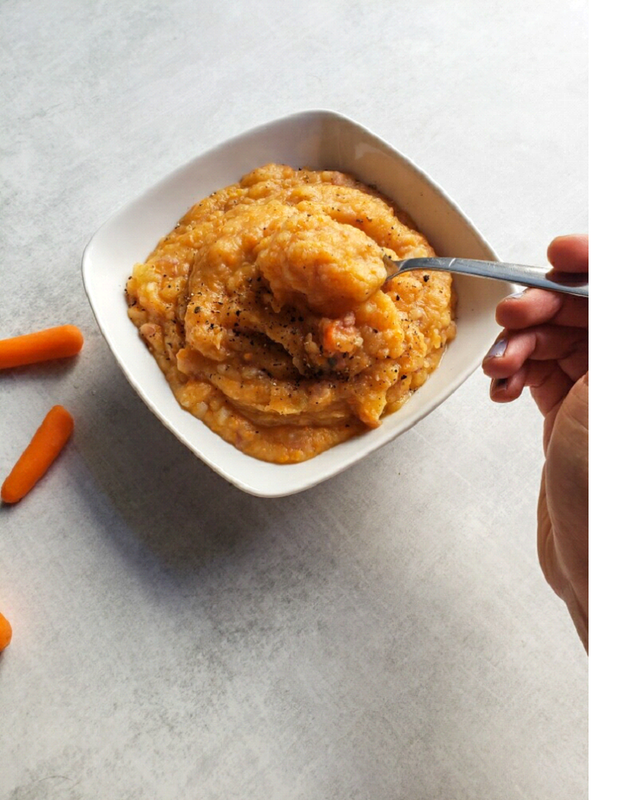 Add onions, potatoes in carrots into InstantPot with vegetable broth. Seal the lid and cook on soup setting for 10 minutes. Once timer beeps release pressure using the valve. Pour contents into Vitamix and blend up! If you don’t have a Vitamix you can mash using a potato masher. Pour back into InstantPot and add instant potatoes (measurement based on desired consistency), salt, and pepper. Stir together until incorporated. If too liquid for your liking, add more potato flakes. If too thick for your liking, add more broth or a splash of almond milk. Mar 16 Healthier Vegan Cookie Bars!